Though I am quite the bookworm, I find when I start a book I can’t do anything else until I finish the story. I really hate putting down books halfway through, and that can sometimes cause problems when I have exams to study for and errands to run. 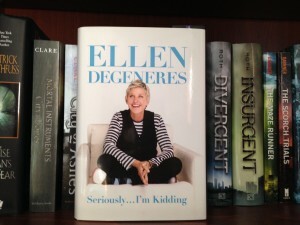 The book Seriously…I’m Kidding by Ellen DeGeneres is one of the only books I own that I can read when I have a lot going on. This is more of a comedy/light-hearted book that doesn’t have a continuous storyline. It’s the kind of book that I can pick up, read a chapter, then continue with my day without feeling devoted to finishing it right away. Each chapter is a separate topic and they range from 2-10 pages long. I really enjoy this book as a casual read. There honestly is no storyline, but it’s entertaining and good to grab when you just need a break for a few minutes. If you are looking for an easy read that doesn’t require much commitment I definitely suggest checking this book out. Since the new year is a time for new beginnings I thought what better way to debut my new blog platform than to release it on New Year’s. For those of you that don’t know, I’ve been working on my own site and writing off-and-on for about 5 years now. This originally started off as a creative outlet when I started University, but after sporadically working on it for so many years it needed a fresh start. I’ve changed a lot from when I first started this blog. I’ve become more independent, gotten married, and essentially grown into what some may call an adult. It was time this blog reflected the person I’ve become rather than the person I was when I graduated high school. This new blog will be more of a culmination of my interests rather than my off-handed musings whenever inspiration hits. Happy New Year & I hope you enjoy reading!